Who is Village Vocal Chords? 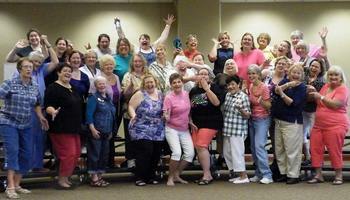 The Village Vocal Chords chorus has been an organized women's barbershop chorus since 1960 and was chartered with the international organization of Harmony, Inc. in April of 1961. Harmony, Inc. was founded on February 26, 1959, in Rhode Island, and presently has approximately 3000 members within the U.S. and Canada. VVC holds the distinction of being the first women's chorus invited to perform at a Barbershop Harmony Society convention. In July of 1991, VVC members performed with other quartets and choruses from around the world on the World Harmony Jamboree in Louisville, KY, and have repeated this appearance in 1995 in Miami, and in 1998 in Atlanta. In September of 1992, VVC crossed the Atlantic as invited guests of LABBS (Ladies Association of British Barbershop Singers), to perform at their annual convention held in Warwick, and in March 2003, performed in Holland as invited guests at their European Women's Barbershop Contest. VVC is thrilled to represent women's barbershop to our sisters across the Atlantic. We rehearse on Tuesday nights at 7:00 pm at St Luke Lutheran Church, 23W080 Butterfield Rd, Glen Ellyn, IL 60137 unless otherwise indicated on our Calendar. Want Village Vocal Chords to sing at your next function? 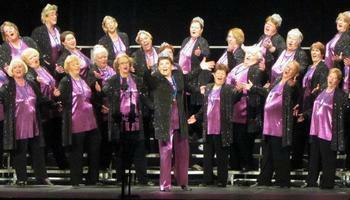 Why not hire Village Vocal Chords to entertain at your next event? We can perform at corporate functions, charity events, community Entertainment events, birthday parties, christmas parties, awards nights, weddings, engagements, anniversaries, engagements, and even funerals and memorial services.